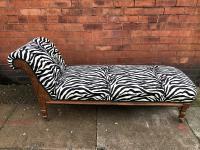 An Edwardian chaise longues recovered with zebra fabric. On its original castors. A real eye-catching piece. 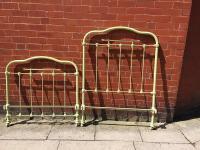 A cast iron and brass Victorian single bed painted. The brass areas have been left exposed and are nicely polished. 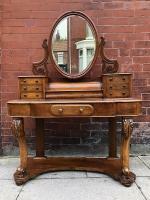 Would look great in a childs bedroom. A very solid piece. 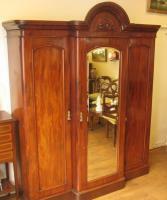 A large triple mahogany Victorian wardrobe C1880. The middle section is complete with it's original mirror and opens to reveal slide out open drawers to the top half and the bottom with three fitted drawers. 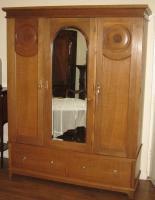 A 1930s oak triple wardrobe with central mirror and two lower drawers in superb condition. 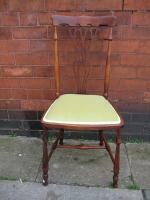 Edwardian commode/stool with original bowl in. Has a pull out step to. With original tapestry fabric. A single pine wardrobe C1900. The item comes in three pieces for easy removal. 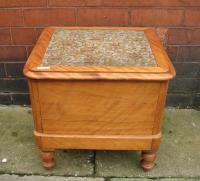 Has a large single drawer at the bottom. In great condition. 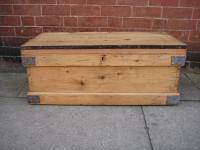 A small Victorian pine blanket box which could have originally been used as a tool box.